The guide was developed with funding by Patagonia Provisions®, the State of Hawai‘i Department of Agriculture, Western Sustainable Agriculture Research and Education, the Kaua‘i County Office of Economic Development and published by the Breadfruit Institute of the National Tropical Botanical Garden, Kalāheo, Kauai, and Permanent Agriculture Resources, Hōlualoa, Hawai‘i. Hard copies can be purchased from online retailers such as Amazon.com. There's also a web pdf edition. Learn about planting, caring for, harvesting, and consuming breadfruit. Here, Heidi Bornhorst talks about tree care and pruning at the March 3 workshop at Maui Nui Botanical Garden.The Breadfruit Institute of the National Tropical Botanical Garden (NTBG) in collaboration with Agroforestry Net is presenting six one-day workshops on growing and caring for breadfruit and regenerating Hawai‘i’s agricultural lands with breadfruit agroforestry. The workshops will be held 8:30 am - 4:00 pm at each location. This workshop will expand participant's knowledge in many areas from planting to maintaining to consuming breadfruit. Growers, homeowners, processors, sellers, chefs/restaurateurs, consumers, educators, policymakers, and others interested in regenerating breadfruit are encouraged to attend. The workshop fee is $35 (includes lunch). Space is limited so please register early. Registration is required. Please see below for details on workshop topics, presenters, locations, and sponsors. 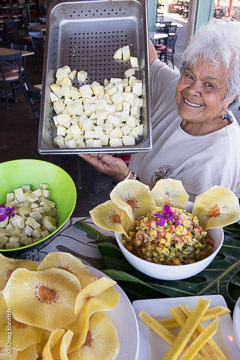 Auntie Shirley Kauhaihao displays Sam Choy's breadfruit dishes. The workshop will introduce a range of products that can be made from breadfruit. 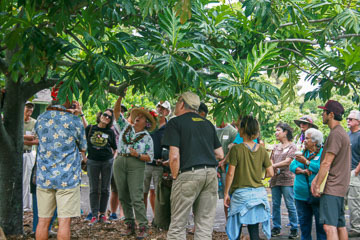 Noel Dickinson of the Breadfruit Institute shows participants the agroforestry demonstration site at the Kauai workshop on February 10.Breadfruit is an iconic tree that has been cultivated sustainably by Pacific peoples for centuries in landscapes that we today call "agroforestry", which combines a diversity of trees, shrubs, and crops together in forest-like plantings that provide many benefits economically, socially, and environmentally. A breadfruit agroforest can be any size: backyard, small farm, or large, diversified agriculture. 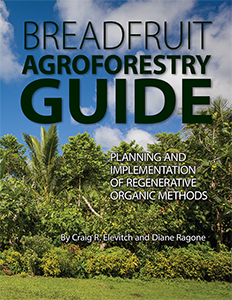 Participants will leave the workshops with an in-depth perspective on breadfruit establishment and care, breadfruit varieties, regenerative organic agroforestry with breadfruit, product options, and economic evaluation. 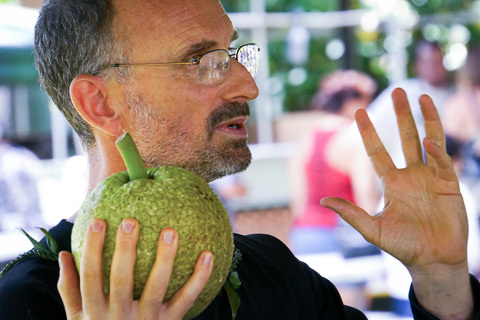 Dr. Ragone is an authority on the conservation and use of breadfruit. 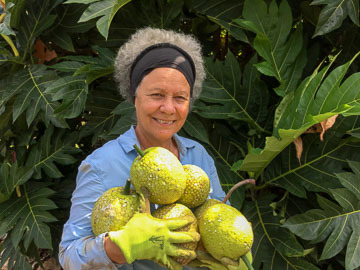 She has conducted horticultural and ethnobotanical studies on this important Pacific staple crop for 35 years in 50 Pacific islands and helped establish and curate the world’s largest conservation collection of breadfruit with 150 varieties. 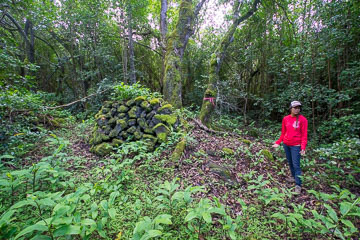 She has served as Director of the National Tropical Botanical Garden’s Breadfruit Institute since its creation in 2003 to promote the conservation, study, and use of breadfruit for food and reforestation. She is co-director of Ho‘oulu ka ‘Ulu—Revitalizing Breadfruit, and serves as Affiliate Graduate Faculty at the University of Hawaii in the Department of Tropical Plant & Soil Sciences and the Ecology, Evolution, and Conservation Biology program, and received a MS and PhD in Horticulture from UH. She is a member of the Society for Economic Botany, International Society for Horticultural Sciences, and the Explorers Club. Dr. Ragone has written over 100 publications on breadfruit, horticulture, and native Hawaiian plants. In 2015 she was honored as the University of Hawaii’s College of Tropical Agriculture’s Distinguished Alumna and in 2016 received the Garden Club of America’s Medal of Honor. Craig Elevitch has been an educator in agroforestry and sustainable agroecosystems since 1993. He is co-director of Ho‘oulu ka ‘Ulu—Revitalizing Breadfruit and agroforestry director of the Pacific Regional Breadfruit Initiative, projects established in 2010 to foster economically and environmentally regenerative breadfruit agroforests in Pacific Island landscapes. He directs Agroforestry Net, a nonprofit educational organization dedicated to agroforestry and ecological resource management. The organization’s internationally recognized publications and workshops have guided thousands in becoming more proficient in food production, agroforestry, and reforestation. 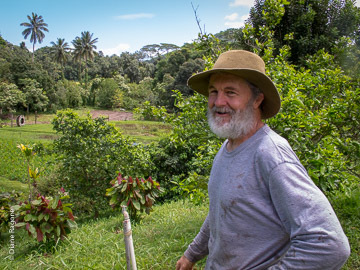 Craig has facilitated numerous agroforestry workshops in the Pacific, with over 5,000 producers and resource professionals participating since 1993. His agroforestry publications have garnered millions of Internet downloads since 2000. These include Agroforestry Guides for Pacific Islands (2000), Traditional Trees of Pacific Islands: Their Culture, Environment, and Use (2006), Specialty Crops for Pacific Islands (2011), Breadfruit Production Guide: Recommended practices for growing, harvesting, and handling (2014), and Agroforestry Landscapes for Pacific Islands: Creating abundant and resilient food systems (2015), all of which advance diverse agricultural systems that are environmentally and ecologically sustainable. Heidi Leianuenue Bornhorst, owner of Pruning for Productivity, is a Certified Arborist, Horticulturist, and Landscape Designer specializing in appropriate and practical landscapes designs and plantings in Hawaii. 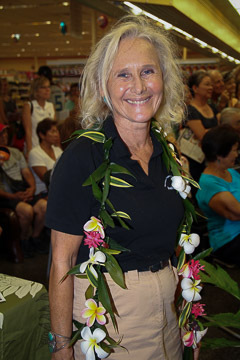 She is an expert on native Hawaiian plants, sustainable food production, aquaponics, and xeriscape gardens. Heidi is an accomplished and dynamic public speaker and Garden writer. 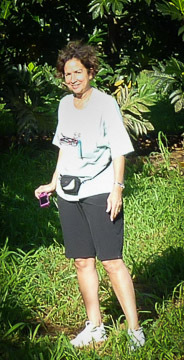 She has worked at the Hale Koa Hotel, Honolulu Botanic Gardens, Lyon Arboretum, Honolulu Zoo, and the University of Hawai`i at Manoa, and consults on numerous projects for businesses, homeowners, schools, and nonprofit organizations. 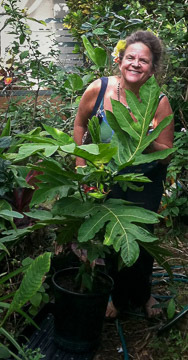 Heidi serves as the O`ahu Coordinator for the Breadfruit Institute’s Plant a Tree of Life project, advising on breadfruit tree planting, care, pruning, and long-term tree care. Heidi got her start in the Green Industry as an Apprentice Gardener at the National Tropical Botanical Garden on Kauai, and has a B.S. and M.S. in Horticulture from UH Manoa. She is a member of the Outdoor Circle, the Garden Club of Honolulu, and the Landscape Industry Council of Hawaii and serves on the boards of the Halawa Xeriscape Garden, Kapi`olani Park Preservation Society, Friends of Honolulu Botanic Gardens, and Scenic Hawaii Inc. Heidi is author of the popular book Growing Native Hawaiian Plants, and writes the Hawai`i Gardens column for the Honolulu Star Advertiser newspaper. Dr Tusi is the director of the multi national award winning Pacific Business Center Program (PBCP) and the executive director of the Honolulu Minority Business Enterprise Center (HMBEC) at the UH Mānoa Shidler College of Business. A former research fellow with the Pacific Islands Development Program at the East-West Center, Avegalio is the first native from Oceania to become a professor at the Shidler College of Business. He has consulted extensively for traditional chiefs, village councils, governments, colleges and universities, financial institutions, multi-national corporations and businesses nationally and internationally. 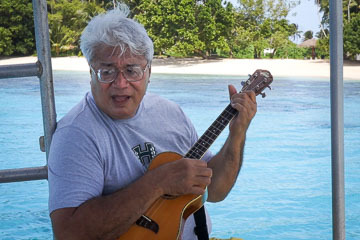 He also has been the primary organiser of many events, such as the University of Hawai‘i Stars of Oceania to recognise the contributions of Pacific Islanders to the State, Nation and World inaugurated in 2006 with most recent event in American Samoa in 2017, and Regional & Global Breadfruit Summits in American Samoa (2013), Hawai‘i (2016), and the recent 2017 Breadfruit Summit in Apia, Samoa. Dr Tusi has a doctorate in educational administration from Brigham Young University in Provo, Utah. He is a Polynesian alii and senior heir of the Malietoa warrior king line of Samoa holding the traditional title of ‘Papali’i’ from Savaii, Samoa. John Cadman is a chef, entrepreneur, and educator who is passionate about breadfruit. Previous to founding Maui Breadfruit Company in 2013, John worked in the hotel industry and as a School Food Service Manager for 15 years (Haiku School, King Kekaulike High School, Kamehameha Schools). Maui Breadfruit Company has won numerous awards in its short period of operation including the Maui Ag Fest, Whole Foods Hawaii ‘Ono Awards, Sustainable Dishes Maui Time and others. 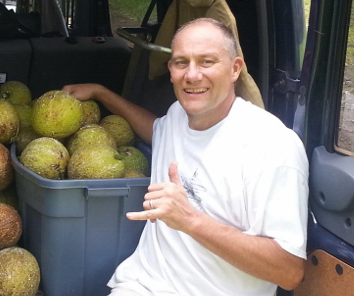 John’s mission is to restore breadfruit as a major food crop in the Hawaiian Islands. He is continually working on developing new value added breadfruit products, campaigning to get breadfruit planted in all Hawaii schools, and consulting for other value-added producers. John has an on-going partnership with the Breadfruit Institute. Noel Dickinson, born and raised in Hawai’i, is passionate about sustainable, tropical agricultural practices that are ecologically and socially conscious. She strives to put into practice concepts and theories she has learned academically as well as through her experience farming. She brings this same enthusiasm to her family’s small farming venture, Waikahe Farms, where neem trees are grown, fruits harvested, processed, and value-added products are created on Kauai. While attending the College of Agriculture, Forestry, and Natural Resource Management at the University of Hawaii Hilo, Noel earned a Plant Tissue Culture Certification for breadfruit micropropagation and a B.S. in Tropical Plant Science and Agroecology. After working as a Horticultural Technician in the McBryde Garden of National Tropical Botanical Garden, Noel had the opportunity to join the Breadfruit Institute team as a Research Technician. Noel manages a dynamic breadfruit agroforestry demonstration centered around the McBryde Garden Breadfruit Research Orchard and assists with various research projects related to NTBG’s breadfruit conservation collection and information resources. Natalie Kurashima was born and raised in Waipiʻo, Oʻahu and currently lives in Halekiʻi, Kona. 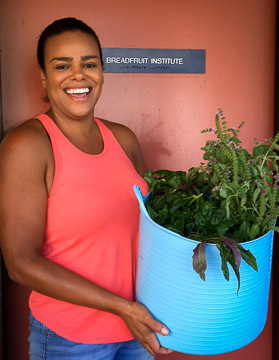 Currently, she is the Integrated Resources Manager on the Natural and Cultural Resources team at Kamehameha Schools, with a kuleana to support community contributions in ‘āina stewardship across the archipelago. She received her PhD in Botany from the University of Hawaiʻi at Mānoa investigating the biocultural restoration of indigenous agricultural systems in Hawaiʻi, with a focus on the on-the-ground restoration of a dryland agricultural system in Kahaluʻu, Kona. Berta graduated from Kamehameha Schools Kapalama Heights in 1974. She is a multitalented creator and innovator: farmer, photographer, and cultural practitioner. She and her 'ohana grow 'ulu in Keauhou, Kona, and other locations in Hawaii. Her company start-up, Hawaiian 'Ulu Company, broke new ground in product development for local and export markets. 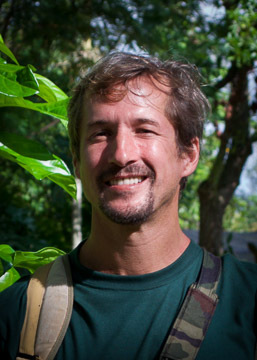 Paul is co-founder and director of Regenerations Botanical Garden, and serves as project manager of Kaua`i Food Forest, a 2-acre multistory agroforestry site with over 200 plant varieties located on Kaua`i’s north shore. In 2017, he was contracted to establish Phase 1 of the Breadfruit Institute’s Agroforestry Demonstration Site, located at the NTBG’s McBryde Garden. Paul offers consultation and installation services for agroforestry projects to the residential and commercial markets. Hōkūao Pellegrino was born and raised in the ahupuaʻa of Waikapū on Maui. He lives on his family’s kuleana land where he manages Nohoʻana Farm, established in 2004. There, he is restoring an extensive system of loʻi kalo terraces while cultivating ʻulu and other Hawaiian food crops interspersed amongst the cultural landscape. Driven by their farm’s mission, “E ola mau ka mahiʻai kuʻuna – Perpetuating Hawaiian agriculture”, Hōkūao engages over 1,000 Maui school students a year through a comprehensive bilingual cultural-ag education program that he developed. 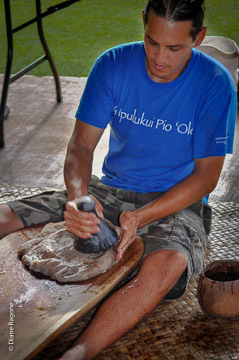 He also produces value added products, such as, Waikapū Poi and Palaoa ʻUlu (ʻUlu Flour). Aside from his family farm, he works for Kamehameha Schools in the ʻĀina Engagement Division as a Land Administrator, where he manages agricultural and conservation collaborations on Maui, Molokaʻi and Hawaiʻi Island under the ʻĀina Ulu Land Legacy Program. Hōkūao has spent over 20 years immersed in archival and field research throughout Polynesia and across the U.S. He has published a number of articles and reports on the Hawaiian land tenure, agricultural systems and water resources of Nā Wai ʻEhā, Maui. Dr. Carmen Nochera is a professor of nutrition at Grand Valley State University in Michigan where she designs curriculum and teaches courses in Food Science & Technology and in Nutrition & Dietetics. She has a PhD in Food Science and Nutrition and an MA in Science Education from the University of Rhode Island. Dr. Nochera is a Registered Dietician/Nutritionist and actively involved in community outreach on health and nutrition for diverse communities and audiences on critical health topics such as nutrition and weight control, heart-smart diets, weight management, fat and cholesterol, and aging and nutrition. She is a member of the Society for Nutrition Education, Academy of Nutrition and Dietetics, Institute of Food Technologists, and several Academy of Nutrition and Dietetics Practice Groups. Dr. Nochera has been involved in research on breadfruit flour since 1992 including developing and evaluating value-added products such as bread, biscuits, extruded cereal, and most recently, a ready-to-eat bar. Gerry Ross is co-owner and operator together with Janet Simpson of Kupa'a Farms, a 16 acre organic farm on the slopes of Haleakala on Maui. The farm raises coffee, vegetables and tropical fruit and focuses on sustainable agricultural practices that include composting of island food waste, crop rotation, cover crops, and the creation and maintenance of a biologically diverse farm with the intent of maintaining soil quality and decreasing soil erosion. 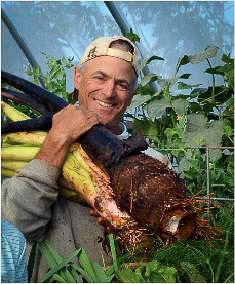 Gerry has taught classes for Maui residents on organic and sustainable agriculture for over 10 years. Originally trained as an earth scientist, he has turned the power of thoughtful observation into a solid and very tasty farm. 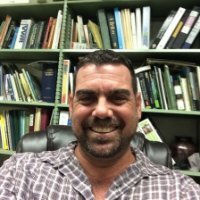 Dr. Radovich is an associate specialist in the College of Tropical Agriculture and Human Resources at the University of Hawai'i at Manoa (UHM). Ted received his B.Sc. and M.Sc. from UHM and his Ph.D. from Ohio State University. In addition to serving as WSARE PDP State co-coordinator, Ted co-coordinates the Sustainable and Organic Agriculture Program at UH Manoa and is principle investigator of the Sustainable and Organic Farming Systems Laboratory. The links between ecological farming practices, yield and crop quality are the primary focus of his lab's research. Ted also teaches multiple classes, including Herbs, Spices and Flavorings, Organic Food Crop Production and Vegetable Crop production. Charlie and his 'ohana have been farming for over 35 years. He is a lifelong resident of Hawaiʻi and got into farming by chance when he and his brother Paul first planted dryland taro on land owned by a patient of their father (a medical doctor). Charlie is a member of Hui Ulu Mea ʻAi, a group promoting community self-reliance and advocates for backyard gardens. Waianu Farm in windward Oʻahu’s Waiahole Valley is long and narrow, bounded on one side by a river and on the other by forest, with a diversity of crops grown reflects the complicated topography. The main crop is wetland taro grown in traditional loi. He has been growing and selling 'ulu for many years. Waianu Farm produces food using the practices of what could be called “endemic” farming, using local inputs as much as possible, and by utilizing appropriate scale science and technology. Links are given below for Google maps of each workshop location. As part of each workshop will be held outdoors, please bring sun protection (hat, long sleeves, sun screen, etc. ), rain jacket, mosquito repellent (if you are sensitive), and wear shoes suitable for walking outdoors. Registered participants will receive detailed logistics information a few days before the workshop takes place. The workshops are co-sponsored by Patagonia Provisions® and the State of Hawai‘i Department of Agriculture and presented by the Breadfruit Institute, National Tropical Botanical Garden and Agroforestry Net. 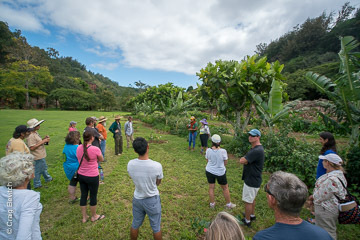 Local hosts include Maui Nui Botanical Garden (Kahului), Foster Botanical Garden (Honolulu) and the Sustainable and Organic Farming Systems Program, UH Manoa (Waimanalo).